Posted on October 17, 2013 This might be outdated! 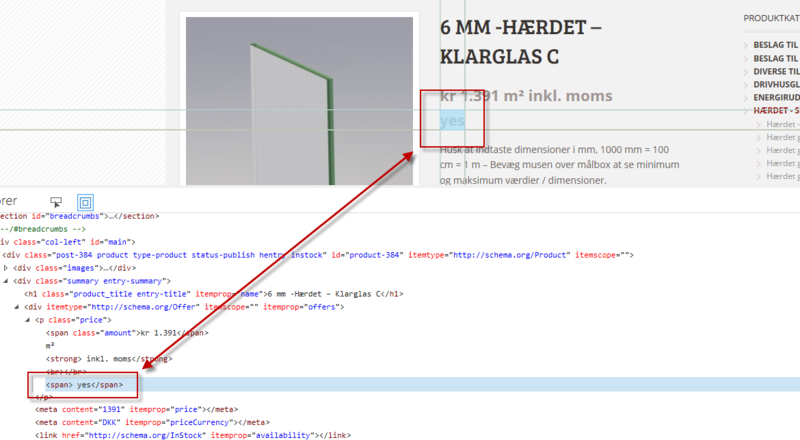 As you can on the screenshot above we will see how to add custom fields to the product edition page. To do that we will be working on the functions.php file of your theme’s folder only. To begin we will add custom fields to the product general tab, we will see later how to add custom fields to the other tabs, and how to create your own tabs. Please note the use of desc_tip to display those little nice bubble to the right of the field instead of displaying the default field description. This attribute works for every field type. The main difference here is the type attribute set to number. You can also define custom attributes like step, and min, or even max. In the code above, step is the default one (1), and min is set to zero. Basically that means that we expect a positive value here (at least greater than zero). The options attributes defines available options within an array. Custom fields can be pretty much everything, just make sure that you use the form-field class to make them pretty! To get those values we just need to use the popular get_post_meta() function. That’s pretty much all you need. I recommend you to style your tab using a bit of CSS (simply add a nice icon and you’re done!). One more thing: if you want to add your fields to any other tab than the general one you simply need to modify the hook name you linked your woo_add_custom_general_fields() function to. 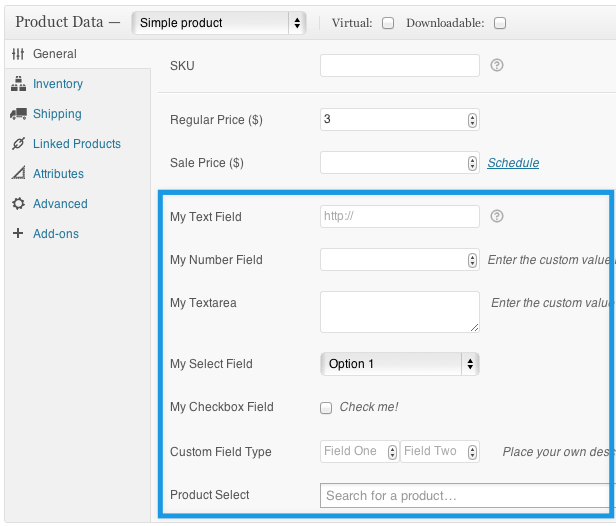 Fo example use that hook woocommerce_product_options_shipping to add your fields to the shipping tab. You can find all the available hooks in woocommerce/admin/post-types/writepanels/writepanel-product_data.php. Thanks so much for this. I have been looking to put a small text area at the bottom of the edit order page with some data I captured into MySQL. I think I found it! Actually, I just re-read the article.. Is there a way to do something similar to this on the Order Edit page? I just realized you are showing a demo for a Products page. Hi Remi. I’m very interested in how to add custom meta to the orders page if you have time. This post has been great for getting the custom fields in the Product page and displaying them to shoppers. I have data that I want to place in custom product fields that relates to distributor’s SKUs and admin info. Is there anyway that I can get these custom fields to display in the Order Edit page for each product? Likewise, can these be displayed in the admin email notification? It would be great if you could point me in the right direction. Any chance you have worked a post showing how to add custom fields to a “new order” screen? I have a scenerio where I need to have up to 12 custom fields added to the existing “Shipping information” area in a new order admin screen. Other then the “standard method of adding custom fields”. I had been talking to someone at woocomm that said that function was being looked at, but nothing to todate. Thanks for this great post, I know it’s not related to this post but do you know how we can count product attached to a specific attribute ? I’m trying this out and you say that we are only working in functions.php but when I put the text area code snippet in my functions.php file it broke. I guess I’m not understanding where to put the code? this is what I put in my functions.php file. Do you have a finished working example that we can see? follow up question. I want to add these to Tabs instead of General or shipping but I cannot find the right hook like you mentioned. We do have “Woocommerce tab manager” plugin installed and I looked in the “writepanel-product_data-tabs.php”. Our ultimate goal is to be able to export.import our product data but we need the data to include the custom tabs we created. –Having the same problem, but am not sure what to put within the echo”; ?? ?? My function.php file continues to break. I tried adding the code to the functions.php in the theme folder but it alters the products general tab in the admin of WooCommerce. I would send you screenshots but it’s not possible here. Thanks for getting back to me, I tried again and I was successful. I do have a question however, I thought the custom field would enable me to add a custom text area on the product page so customers could add their comments for the check out. I’m selling meat and poultry and I want the customer to be able to add his/hers own comments – for example: Filet Mignon – comment ‘ cut into medallions’. And for that comment to be added to the comment area of the order. Is that possible at all and similar to your guide here? I mean what’s the status of the tutorial. How much time do you need until its finished? This is a great Tutorial. Could you please give an example of ‘my-field-slug’ for the get_post_meta() function? the field slug can be whatever you want, simply do not use special characters, spaces and you’re fine! Thanks Remi for your reply. May be my question was not clear. As you have added some custom fields by the above code, what would be the code to retrieve the value of the first text field for example that you have added. I understand the slug part is required to locate the field and its syntax but where did you set it for the custom fields that you have added? Mahfuzur Rahman in this example slug is represented by id, for example slug for checkbox is “_checkbox” in the given array ‘id’ => ‘_checkbox’. Can a Date Picker function be added to the above custom fields? And how would these added functions get added to the Customer Emails and Order Edit pages? Thanks very much for this – I’ve been trying to get this done all day! 1) Is it possible to sort a product list using a numerical field like this? I’ve implemented this. Is it possible to get the info to display on the admin emails? I’ve tried adding the post meta data code. But nothing is showing. I need this to display an internal product code to ease product packing. Cheers for the great tutorial! I’m still getting a blank area when I try to display the info in the email. Here is the code in functions and the email template. i use plugin WP User Frontend Pro to add products to Woocommerce from frontend. How i can add these fields to Wp User Frontend Pro form? It took me a few tries, but now it works like a charm! I posted a tailgating blog about this at: http://ingoodcompanywebdesign.net/blog/project/custom-fields-for-woocommerce-tailgating-remi-corson/ , I hope thats okay – if not just let me know. I have two custom fields and there is a descriptions both. When i leave field blank, field descriptions appears still on product page. How can i hide empty field descriptions? I followed your post, Ingoodcompany, and it made the description, sku and add to cart function disappear. So I removed the span wrapper tags and just the label shows up. It’s not displaying the info from the _select ID that I’m using. Any ideas why? I have just one question: I created a Textarea Field Type and when I put some text and hit Publish it’s displaying on my front-end. However when I remove the text to clean the front-end and click on Publish again it stays on the Textarea Field and on the front-end. What issue do you experience? I have more fields but its pretty long. I got the fields to appear on the product edit page and can enter and save but no display. Please help. Been trying for two days now. Man i have. I thought i copied it to last message. It still isn’t showing. Maybe im doing it wrong. Could you please just use the above example and write it out for me? I made the custom template for single description and put it in my themes woocommerce folder. Nothing i do works, I’ve tried everyones suggestion to no avail. Please help! Thanks so much for this awesome tutorial, much appreciated. I’m using this inside a conditional statement in a project where if the meta text-field created by your process above is empty, then neither it or the wrapping copy are displayed. Straight forward and works great. Challenge though, if there is a value given to the text field in WC, but then the user wants to clear it, it will not except a null value. If I delete the value in the backend and then update the page, it repopulates from the database. Obviously if I put a space to cheat, then the wrapper text I want to hide with my conditional is echoed with that space. How can I get the DB to “forget” the value I’ve entered? Is there something along the lines of the save code above for expunging values or another function I can research? Thanks in advance for any guidance! Looking forward to your next tutorial. Are you saying that the placeholder’s value is stored in the database or the default value you defined for the field? The value would be coming from the database. I am not using a default value or even placeholder info. It is a text field representing a suggested price value. If I go to a product and never touch the field it’s perfect (no data), or if I always want a value represented its perfect. However if I add a value today and then tomorrow I want it gone (data reverting to no data) then tough luck it seems. I clear the field so nothing is there (like it would have been prior to ever typing in it), update the product and the field repopulates with what I just removed. Hope that makes sense lol, it’s very early in the morning here. Hey, I’m trying to do the same thing with, that if the text field is empty, is not shown on the description, can you pass me the code you used for that please? Just wanted to say thank you for this been looking for something like this. Also it’s weird that it’s not apart of woocommerce as it is essential to ecommerce web sites. I followed what he said and I got everything working just fine with one glitch. It’s working fine for the products that were originally on the store. If I try to add a new product and I add the details for the custom fields it won’t show up on the Product Detail page. I also have the Woocommerce CSV Importer from woothemes and when I export I see the data and I tried importing new data and It wasn’t showing up on the Product detail page. What’s the issue you’re experiencing exactly? I then realized what my problem was and simply put it on top of that if condition! I’m trying to get this information displayed in the front-end I’ve tried this but with no luck. I am working on a project based on a template called ‘Bazar’ that already have override woocommerce template. am I doing something wrong? r maybe it’s a problem with overriding woocomerce twice? I mannaged too sort it out. I have another question: can the new custom fields I’ve created be sent to the shooping cart? so the customer can see what material for example he has chossen for the product without the need to go back to product page.. I mean where is this new meta data being saved and for whom? I’m a starter in WordPress and looking help for custom fields for woocommerce products. For the project, I’m using a Child theme with Responsive Free (by cyberchimps) theme as parent. My Problem: To follow your steps, I created a functions.php file in child theme folder with php opening and closing tags and no whitespaces between them. The site is broken and displaying white dead screen… How can I fix the issue? Try “removing” closing php tag in your functions.php file in child theme. Although solved the problem I was facing, got another query. How can I display all the custom fields created in the single product summary? I’m having some trouble again but this time its if I want to delete the custom field text. It won’t delete. If I update the custom text field it will update fine but If I delete the text it won’t delete. Seems like I’ve figured this little bug out. You were updating the field when the value was not empty but not when it was empty. What if I want to add a custom field for the user to fill out. For example, I want the user to be able to order a customized product: a dog bowl with their pet’s name on it. He needs to type the name he wants on the bowl in a field that submits with his order. What kind of plugin can I use for this??? With the method explained in that post you don’t need any plugin. You just need to add little script to display the field value on the edit order page. Thanx buddy.. its was really helpful for me,…. This is a very thorough and instructive post. 1) In the last part you give the code to add a custom tab, => works ok, but how would you add those extra fields in the right part fot that tab ? or should i add something in the core plugin in woocommerce/admin/post-types/writepanels/writepanel-product_data.php. ? 2) You give example for textfields, textareas, select…, which are useful, but can i add image/file fields ? Hi Remi, Happy New Year! I want to add some text input fields to the cart page and display the user’s inputs in the “order items” area in admin dashboard. Which hooks shall i link to? I have a project that needs custom fields for variable products, any chance you will be diving into it soon? or could i hire you to? I will post a blog post soon regarding custom fields for variables products. Any possibility of writing that post on custom fields for variations? I’m just trying to achieve that. Is it so different to this one? Also, I haven’t been able to find the ‘woocommerce_product_options_general_product_data’ hook anywhere in Woocommerce’s documentation, except looking through the files on the plugin, under the post type write panels. I’ve been trying to do the same for variations without luck so far. It would be great if you could enlighten us a bit here ;). Am also looking at some of you plugins on codecanyon. Pretty interesting stuff! I’m also interested into your tutorial to add custom fields for Variation products :-). Custom fields disappeared after adding product. I have a two custom fields, when i add information, the fields are gone for general_product_tab. Thanks for the awesome tutorial, really helped me out. Just have one quick question with regards to the custom tab snippet you have provided. Have got this all working fine, but can’t seem to get the right function to add fields into the custom tab? I’m looking forward to your next blog post about custom fields. I’m trying to finish up my site and this is one thing holding up the launch. Do your instructions above basically accomplish the same thing that the Personalized Product Plugin does? Thanks a million! I have a question on how to display the fields. Where do you set ‘my-field-slug’? Is my-field-slug the same as the name of the field? On the page http://www.mineoppskrifter.no/lyse-muffins/ I want to list ingredients in text fields. How do I make so that the text empty text fields are not displayed? And one more question please. How do I display ‘label’ in front end before the id name? Now I have another question. When I delete the value in the custom field, the value will not be deleted when I save the product. The only way I can delete the value is to remove the value both in the product custom field and in the wordpress custom field at the same time. How can I avoid this and just delete it in the product custom field ? Hi Remy, can I use the checkbox field to give the product a CSS class? I have to replicate the OnSale badge to mark some product, but i have no idea how to do it. I have a little budget to develop this, can you contact me? how can i do it please help me. Thanks for your great tutorial. I was also trying to add some custom fields to the “Cart Page” according to this, but failed. Can you pls advise how? I’ll be very appreciated for that. First of all a hearty thanks for such a useful topic. A lot things are resolved in an individual page. So i wanted to know that i got stuck in Products Select Field Type. do i have to use some [index] fields or how it can be sorted. Remi, thank you for all the info, been searching for some time. It reads YY-MM-DD, and I’d like to be able to set HH:MM in addition to the schedule as well. Hello Remi. I like your work. I have a question for you about “Mastering WooCommerce Products Custom Fields”. Everything works great, but I would do so, select the field showed me the pictures. For example, if I select “Option 1” is on the side to show me a picture 1.jpg, or if I choose “option 2” it will show 2.jpg. Is this possible and if you can help me with this? I’ll be very grateful. Awesome post Remi! One quick question though. Let’s say I wanted to build a plugin that allowed the user to link up Woocommerce products. how would I include the product select field type in the plugin meta box? I’ve tried and while the basic field shows up, the magic of making the ajax call etc. doesn’t seem to be working. I’m so close! This is Really Awsome Post! i am trying to use woocomerce ajax chosen for my case but it’s not help!! can you give me some hint about my problem? but i want to return results by ajax! I am in the same boat as oblax, if you could also show how to add the custom field to the Quick Edit that would be great. Hello I’m a new user and i need help. code but only one of the custom fields displays. Is there something you could suggest? I was wondering if the underscore had to preced the field name. is it also possible to create a custom text field for a ‘Grouped product’ ? I really need this or an alternative. this is a great tutorial, but for some reason I’m not doing it right I guess. I did manage to add all to functions.php file, and I can see my custom text field in product settings. I can save new label as well, but I need that label to show adjacent to product price on frontend page. But that’s jus beyond my wordpress knowledge. I just need to know where to place that peace of code in order to see saved values on frontend page? Ok, I managed this. Thanks’ a bunch great guide. I have one more issue. I’m using three checkboxes on my product edit page, and the problem is, when I check those boxes, values are saved, but on refreshed page boxes are not checked? So how do I ensure that one or all boxes stay checked after save? do the checkboxes have the same ID? again with same outcome? What am I doing wrong here? No luck when I use code you provided on that link I have same result, no checkbox is selected after save, even thou value is saved? So I can save, I do have as a result what I want for all three checkboxes, but non of three checkboxes aren’t checked after save. I’m sending whole code so someone could help. Sorry but I’m not good with php. Thank you so much for great tutorial! Could you tell me, please, how to add ‘My Textarea’ field (Bijango is my custom subtitle for one of these products) under product title on main shop page? Thank you kindly for any help with that issue! And the result in the front page is only the word “Array”. Nothing more… pls tell me what is going wrong with my code? When i write an URL in the text field in the front end it does not appear like a link. What should i do? Thanks, but when it is shown in the frond end still appear the a tag as simple text. Can I create more sales dates and “activate” them automatically based on the day of purchase? Therefore, if the customer purchases the April 31, the price displayed will be € 450 and not € 500 (which is the regular price). Did i do something wrong, or whats the problem :) ? I still have no luck with those checkboxes. Even when I use your code from tutorial and even when I use different (clean) wordpress website, it’s not working properly. So yet again, values are saved when checkbox is selected and product is saved, but checkbox is not selected after that. So if I choose to update anything on that product and I don’t check that checkbox again it’s going to overwrite previous save. I followed your guide and was able to get a field to show up in dashboard. Then added a line to short-description.php and it displayed on front end. However, its not possible to clear the field after something was added to it. I can change whats there, but not remove. Selecting whats there and clicking delete, then pressing Update and what was there – stays. this is great and works fine. But not on cart page. When I try to get and display value on this page, nothing happens. Custom Field “latinsky” exists and its value displays on other pages. I believe the problem might be in getting the right ID? Can you please provide a fix for data not being cleared on save, when fields data was removed? Thats the most common problem in this discussion..
Hi – love the code – got it to work on the site – only problem I have is then importing a large product database and mapping to the new fields. I can manually enter values into the new fields I created, but when I import (25K+ products) the import tool I use (dgrundel woo product import) it simply creates new custom fields and places them on the additional information tab. I really need the info to display on the main product pages as people who shop this product add multiple items at a time and use those fields to find the right product. Any ideas on how to bulk upload to the new fields? I’ve set a custom field and put a value to test your code. Now I would like to put none value for a product. It seems that I can’t do that. The field requires a value. How to get the possibility to set none value for a field? Hey, I got this working great and I know how to insert this into a template itself but I’d rather place it in a hook via the functions file. I’d like to have this as a conditional so that IF the text field has anything input then display it. Otherwise if the field is blank I’d like it ignored by the template. I’m trying to hook the “woocommerce_product_meta_start” to have the field display there if applicable. Could you possibly provide an example of such a filter/conditional for the functions file? I’m new to the idea of filters and have managed to figure out quite a few… but can’t seem to wrap my head around this one. I was thinking others might benefit from the example as well. If you can’t I totally understand and really appreciate the tutorial you put so much effort into. I’ll just keep trial/error’ing it but if you can help out that would be awesome! CHOKING HAZARD - Small parts. Not for children under ID, "_text_field_age_restriction", $single = true); ?> yrs. Hi! Thank you very much for your article. It’s very useful. that’s weird, this function wasn’t deprecated. I’m having the same error, any leads? I’ll post back here if I find anything. Fixed the problem for myself… I had the declaration hanging on its own, but as soon as I put it inside a function that outputs HTML it was fine. I think I misunderstood the way it works. help me plz i’m still lost on the entire thing??? you can use get_post_meta() function. What should I do to print it on my php script file ..
i have to use this function ……. I would love to see an Extension for WooCommerce to add “custom form fields” functionality to the products pages. In some cases extra information needs to be captured along with the product or service you are selling. I want uplode image section in Simple product area…. How do I upload… Please give me function structure …. Hi Remi – Thank you for this. It is very insightful and I really appreciate it. I do have one question. We used this to create fields that need populated for many products. They are only visible on the back end so they didn’t have to be written to the user interface. I added some code to allow these fields to be exported, however, I would like to populate my spreadsheet and import those products because there are a LOT. I am unable to figure out how to get the product features to write to the new fields I created. So, I hope I am making sense but I can add the fields, get them to export, but I can’t import and write to the fields…can you help? Thank you so much for this lesson, I am actually surprised this is not part of the core of WordPress already. I hope if you have some time and if you have any thoughts or suggestions about what I am doing wrong, you could let me know. here is the new code that is saving to the database in the product, but is still not showing on the front end and has given me a new error..
o first a link to the web page on stake exchange..
then the code that saves to the dbase..
and now my new error when I hit save..
red80% poly 20% cottonCanada90″8″ 900″ o ya lots of inchesthis is an awesome that rocks. I also checked into the guy who tailgated this post.. http://ingoodcompanywebdesign.net/blog/2014/03/17/custom-fields-for-woocommerce-tailgating-remi-corson/ and checked out this too.. http://gerhardpotgieter.com/2013/09/17/woocommerce-custom-product-fields/ and I think my brain is melting now..
Any thoughts you may have would be awesome Remi..
any solution boss? please share with me too. Great code snippet, very helpful. I got it to work great. The text field saves and displays when the product is updated. But if i go in and delete what i have input in the text field and update the product, the text remains saved. I just bought the product-add-ons from Woothemes. I followed your instructions, step by step, and I was able to get the custom fields added into the product page editor in my dashboard, and the fields are saving after I ‘update’ the page, but I’m not seeing any results on the live site. I made sure to include the code that ‘gets’ the new meta data to display it, but I’m still seeing nothing. Any thoughts? Thank you so much for your post has been very helpful to me. I am a rookie in wordpress and all this things. I followed all the steps to create the custom fields and all looks good but know I wanna show it in the page, I attached an screenshot where you can see where I want the fields, please help me with that because I really don’t know how to do that, sorry for my dumb question and my poor English I am not a English native speaker. I figured out how to display the value of the field that I want but its show it w/o the label. how can I display the label of the field? Hello Remi and thank you for your WooCommerce articles and snippets. However, i am trying to find a way to do the exact opposite of this – hide a few of the settings fields to simplify the user experience. What i wish to achieve is a way to define a few of the settings myself and leave only a chosen few to be defined by the user. Is this possible, and how? is there any way i could assign custom class or id to checkbox, so i could have that class/id on single product page? I did used “echo get_post_meta( get_the_ID(), ‘my-field-slug’, true );” and i do get “yes” as value in between span tags, but i would like to stylize that span somehow. So i tried to wrap this span inside of a div but div is not displayed on page at all. So any help from anybody here would be much appreciated. Just simple solution how to add custom class or id to this checkbox span “yes” value? It’s still just a span tag. I do have class under edit product page, but no luck with single product page. I am absolutely dummy to PHP. I really really deserve your reply please. Where I have to post your code in functions.php? anywhere? here is the code which i am pasting in file. anyone who know where exactly is the error, please please help me. Remi! Boss! you be the first & help me.! i am using enfold theme. Hi, Im Antoine from France, sorry foy my bad english. In first, thank’s for your code Remi! I add a field “textarea” it’s ok, i can see it as your screeshot at the head of this arcicle. I have also create (in my child-theme) a folder “woocmmerce” with inside a folder “single-product” and inside a “short-description.php” file. I think a have an (or most) error(s), can you help me? Thanks! It’ok , sorry for the precedent post! I think, my solution, isn’t here!!!! Checkout page. Do you think, it’s possible? I must have ad a type-oh, I re-pasted the “saving field values” code into the functions.php, and now the word “two” shows up on the front-end. I changed the options to ‘new’ and ‘used’ instead of ‘one’ and ‘two’. But it still says two on the front end, and it doesn’t matter if the product is set to new or used in the back end. It also only shows up on one product. any ideas here? Can I add a text editor in this field instead of textarea? Hello Remi, thank you for this article, it’s helped me greatly on a project. I had a need to include a pdf brochures on many product pages, I used your tutorial to add a custom text field for the pdf’s url. Now that I have that working, is there a way to add custom fields to product categories also? My client is wanting me to include a product family/overview pdf to the category pages. Ideally I’d like to put in a custom field/txt input on a categories edit page, in the same fashion as my product edit pages. I want to add a country dropdown select. I see that Woocommerce already loads all possible countries in ‘woocommerce/includes/class-wc-countries.php’. Is there some way I could get those in a php which is located in my theme folder? Thanks for awesome awesome post. I created ‘Two’ custom fields — text field for Date input and checkbox to work like a on-off switch. 1. How can I use date picker (that displays calender for date input) instead of text field ? For example – When checkbox is checked “on” – value is 1, then I want to display a custom message “Ready for Shipping” tag (which can be stylized using css) on top product image on single product page and when it is checked “off” nothing should be displayed. For the date picker i recommend you to install jQuery UI, that’s the easiest way to do it. How can i make a custom field with multiple checkboxes? Thanks so much for sharing such an incredibly useful tutorial. No this is not possible. There’s no hook to add content to the attributes tab. I submitted a patch to WC core to make this possible, let’s see if it gets accepted. In that case that would be doable in the next WC version. Thanks for that! That would be really great. I will follow closely :) Thanks again. Thanks for this tutorial … You’ve helped me a lot! Maybe I can help, I get this code to hide the custom field if the field is empty .. works great! Anyway, I have two problems and no idea how to fix it. 1) I can not edit the custom field and always shows the same data whatever you do. I hope you can help me to solve these problems! The code appears incomplete in my previous comment..
Is there a way to make these customfields searchable in the productsoverview page? What Am I doing wrong? I can’t figure it out.. I think I’ve read this 100 times and still can’t get it to work.. What am I missing? Thanks for your post. It inspires me to create that plugin. This is built on the Genesis framework. This is great, but I would like it to be conditional. I would like to create a dollar value field for shipping that gets added only if International. I would also like an add-on charge for Alaska and Hawaii. Is this achievable using this tutorial as a starting point? How would I make these fields conditional at checkout? Then image will show-up on frontend not html code. Please post I really need it. Previous comment is this code. How to properly display the image not html code with tags. I tried to integrate this using the above codes and nothing happened. Basically what mantis said, I want to show my field on the product or maybe the single product page. Hey I figured Out where to put content on the single product page, but i have 2 roadblocks. 1) I’m only echoing the key, not the value. Ho do I echo the value? 2) The result is showing on the product page but it doesn’t on the checkout page (cart-shipping.php)? How can I show it on the checkout page? Hey I figured Out where to put content on the single product page (content-single-product.php) , but i have 2 roadblocks. 1) I’m only echoing the key from the dropdown list (two), it’s not echoing the value. How do I echo the value? Is there any way I can get the completed code, im not a coder and finding it difficult to add the custom field option on the single product page. Im building a site to sell sheet music and would like to be able to put the composer name and arranger name and difficulty level under the product name. But i can´t figure out how to display the Products Select Field Type in Frontend. I use “get_post_meta( $post->ID, ‘_product_field_type_ids’, true );” but i only get the word “Array” displayed. What i’ am doing wrong? I don’t have a tecnich level so I need some advice. I need to add a simple field in product variations. How can I do it? Could you help me? This tuto is for a simple product but I want to add a field in a product variation? I’m building a site that uses WooCommerce Subscriptions, and I want users to be able to become members of the site, and also associate themselves with a specific real world club. Essentially, I have made a store finder, and I want users to be purchase a level of membership, and then have a drop down of all the clubs on the product detail page. I’ve followed this tutorial, and have the drop down appearing on the back end, but can’t work out how to get it to appear on the front end! I don’t know why but i can’t use $post_id in my plugin so i swith to global $post and the n $post->ID and now i can save and update! Great Post! It helped me a lot for my project. Thanks so much for your tutorial! I have to sign up and log in just to say thank you lol. Great article! It took me a while to get the data to show up in a custom tab, still not entirely sure how I made it work. Anyway, is there a proper way to override the default icon for the new custom tab? Is there a pre-built list of icons I can select from, if so, where might I find those at? great article, one slight area i hope you can help me on. I’ve created a customer text field using exactly your code above – works great. However, wondered if you can help, i’m trying to pull this text field which is saved against a product into the woocommerce orders / customers export plugin here. The array is called nominal and i’m trying to get it in after the META value as seen below. The text field is save din my database at present with the meta_key as “_text_field”. I’ve started where i think i need to get it in. echo get_post_meta( $post->ID, ‘my-field-slug’, true ); ? Which file? Which line? I tried to paste echo get_post_meta( $post->ID, ‘_textarea’, true ); in content-single-product.php but its not displaying. The values are saved in the backend, but not dis[playing in the product page. Please let me know if I am putting the wrong code. appreciate your help. Thanks in advance. Is there any way to make a letters counter and calculate the price of each letter? Also, I’ll need to add other attributes such as thickness and size, but i think it’s easier. I am not an expert at Woo Commerce and would respectfully request your guidance and willing to pay you for your assistance. 1. I have a website project that requires an online catalog to sell used vehicles. The lot owner wants to be able to display 100 used vehicles based upon categories such as make, model, body style. Each vehicle product would require the ability to populate up to 24 custom data fields for mileage, condition, year, color, etc. 2. When a consumer lands on the used vehicle products details page, the lot owner wants to disable the entire cart and checkout process but use a CONTACT FORM SUBMISSION on EACH PRODUCT DETAILS page instead of ADD TO CART. 3. When the shopper clicks CONTACT NOW an ADMIN EMAIL is generated with the shoppers contact information and that email will require to include the VEHICLE sku as an indentifier so the sales staff will know what vehicle the shopper was interested in buying. 4. As soon as the new site goes live the lot owner wants phase two to create an automated cron job so that all current inventory on his site is collected and sent to five third-party website for display on those additional sites. DELETE ALL CHECKOUT AND CART FUNCTIONALITY. AT TOP OF EVERY PRODUCT DETAILS PAGE A SLIDESHOW DISPLAYING UP TO 30 IMAGES OF THAT PARTICULAR VEHICLE FROM VARIOUS ANGLES, UNDER THE HOOD, INTERIOR, TIRES, BODY DAMAGE ETC. I need your guidance what to do first. I read your post on deleting the shopping cart and checkout but should I do that first and then add 2 dozen customer product fields? If I delete the entire cart and checkout will I be able to continue to display the 24 custom data fields on the product details page? How much would you charge me to follow along for guidance as those changes are implemented? See above the third line array( is where the error is appearing when saving in Dreamweaver. Crucial to my project — can you provide a DATE field to give the admin a way to keep track of when the product was displayed for sale 10/21/2014 but it has to be a data field if possible. It’s great tutorial, however I got one problem with getting this custom field on some places like shipping calculator. Shall I use It in other way or add something to make It visible on every page I’d like to ? but I’ve got some problem with checkbox. but I did not check the checkbox still updated as ‘yes’ again. // Custom fields will be created here..
my php skills can be placed in a very small box. Is this, as a plugin, for sale? I’m trying to do this (and the variations version) with a multiselect, which I’d then like to use the “chosen” jQuery feature which WooCommerce uses to make it easier to use. I’ve got the multiselect completed (and can share the code if you’d like) but can’t figure out how to turn it into a “chosen” box? I made some custom product types. I would like to add some custom fields, specific for those product types. So each product type would have its own custom fields. Is something like that possible? I see that woocommerce uses classes like “show_if_external” and “show_if_simple”. Can I use the same method? I’ve a question about to trigger the “Update” woocommerce product action by code. I can’t see it under categories, and in the woocommerce shop page. To view it there, I need to enter as admin in Products, and in its page, click “Update” button. so I thought that if I could somehow triggers the action of “Update” button by code, I solved the problem. How can I do that? is the correct the procedure? can you give me a hint? i have add a custom field to my product page and they works finde, but i want add this field entrys to the cart and checkout page and e-mail-Template. I have same question as above member. How do I call these custom values at the checkout page? If I use the call method you suggested above nothing shows up. It only works on product pages. This would help me also. Did you get an answer to this? Many thanks for this tutorial. I am now trying to add custom fields to the order details page but am stuck as to which action hooks to use. What would be the hook name for the order details page? I’ve searched everywhere but can’t get anything to work. How do I enable my custom field attribute (CFA) to have product archives in my store so I can use CFA in my custom primary menu? This field has been registered under the ‘General’ tab not the ‘Attribute’ tab. Can general custom fields have product archives? I am french, but to make a test I just tried to add your textfield example, so there is no accents or anything else, I can’t figure the problem. I tried to encode my functions.php file into many format but it doesn’t fix the problem. I am using notepad++ to modify the functions.php file. Thanks for this, it’s exactly what I needed! just in case the user want to clear the field. Apologies if this was mentioned in the comment storm above. This 100x!!! @remi, please update your save fields gist to account for saving blank fields to clear data, not allowing users to save empty fields is a bug! Otherwise thanks for the clear and concise tutorial, great read! Hello! Thanks for the tutorial! I’m not very good programing things like that, so I have two questions and I wonder if someone could help me (please!!!). The first: how I do show the information in this form I created in the short description of the product? The second: I want to know if it is possible in one of these lines receive a category (link) and/or tag (link), and if doesn’t exist, create a new category/tag automatically. It worked the first time! I am using an advanced ajax filter and I was wondering why these new attributes do not show up in the list of available attributes to filter on? Any chance you could give me a quote for how much it’d be to get updated versions of this and the Variable code? I’m getting an error using the above, and really need my site to go live very soon. Would love to purchase, if possible. This works great. One problem… how would i adjust the code so that the fields are not put into the system as serialized data? its all fine and nice to have a single meta_key with all the fields from the tab info in it, until you want to import or export the data of 10k products… any tips? My mistake ive been scowering the internet for a week trying to solve this issue and i forgot there are TWO.. count them.. TWO posts on the entire internet that deal with custom fields.. this one and then there is a plugin for a custom field framework.. the framework one is the serialized data. You are welcome to all the people that read this and get frustrated that the code was not show on how to do this rather than how to add it to the shipping tab of an existing hook. 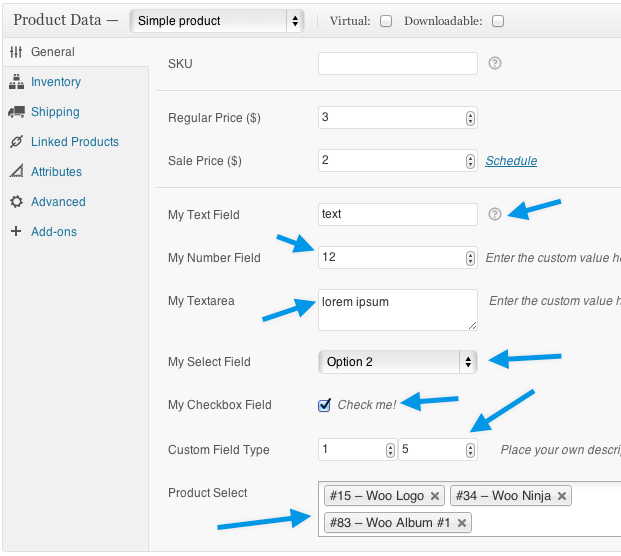 I have the same problem – I created a new custom product tab as shown in the article, but I am not able to add my custom fields to that tab. What do I have to change so that the custom fields appear in the custom tab? I tried to change the ‘woo_add_custom_general_fields()’ link to ‘woocommerce_product_options_custom_tab’, but that did not work. Hey buckneri… Thanks For Suggestion …That was Really Helpful. what i didn’t understand was why that field still displaying in General Tab and its not showing properly . Except That is working Awesome. This tutorial works perfectly! THANKS!!! I added a few custom fields and they work in back-end and front-end (single product page). But I want to add some of these fields on the cart page. So basically I will have Product name and next to it my custom fields. My client has hundreds of products to enter into their site. The WooCommerce product screen has so many entry fields but the client will only be using a few of these – maybe 5 total. I’d like to create a Meta Box on the Add Product screen that only displays the fields that my client will be using, to simplify their experience of posting a new product. but the price is not saved when I update the post, so I’m missing something or I’ve done something wrong. Would you ever consider writing a post on how this can be accomplished? Or pointing in the direction of where some documentation might be that could help with this? Thanks. I am unable to see variations tab in product data meta box. I have checked out the used for variations box in the attributes but still i’m unable to see that variations tab & I’m selecting Variable Subscription. Can you help me out?????? I am battling to display a link. I like to display the product certificate number, ie TH-9465623 which then links to the certificate PDF which lives on another website. Your code works great and I have managed to set up 3 custom fields for my products. However, I don’t want to display them on the product page, I want to display them on the My Account page if the customer has purchased the item. I am really struggling to work out how to do this. Any help would be greatly appreciated. Thanks for this great tutorial. One issue I have is getting my new field to display in most places under the title of the product. I have added this to functions.php and I can enter and save the value in the Sub Title field against the product. However, I can’t display it using: ID, ‘sub_title’, true );?>, I’ve added this to the content-product.php template file and it hasn’t appeared. ok i don’t want to sound Dumb but does all that go into the (edit themes section “Function.php”)??? like i really dont understand or does it go in a new file?? so i placed the text in the functions.php and it broke the site????? First of all thank you for writing such a great tutorial. I have used this for my store. But, what i need is custom drop-down list, let’s say Brand. and once i select one Brand, i want to populate another drop-down of Models. Is there any way to do such kind of things? It will be great if you suggest me solution for it. I am very thankful of you. “Products Select Field Type” Custom Fields not working with WooCommerce Version 2.4.7. Hi Remi, how are you =? Is possible that in woocommerce Dropdown Select Field Type method doesn’t works anymore ? Do you have any suggestion to make it works ? Hey Mate! Forget this comment, i havn’t read very well you post…I solved my problem, everithin is working fine with this version… Thanks again it’s a really helpfull post! Hi Remi… i have created two custom fields with type of text and number type in product page..first i entered some value in both and updated ..then i retrieving those values and displaying in front end… its fine.. But when i clear those two values and make it as empty. and i updated..this time values are visible and appearing previous entered value..
how can i delete these values permanently …. pls help me out ….. Thank you for your awesome article! It’s really helpful me, and I have a question, would have any idea how I can include custom field in woocommerce search widget? Thanks! Thanks for your awesome post. Can you please update the last code (with the product search), because it doesn’t work with the current version of woocommerce. I am using this technique for a plugin that I am writing and it works great. I’ve recently run into a problem where I need to add a drop down select box that contains a LOT of options. Does anyone know of an easy way to turn the select box into something using Ajax? Maybe a search box that populates 100 options at a time and paginates them? I don’t even know where to start with Ajax and dynamically created fields. Very helpful article. I am awfully stuck though. Could you please take a moment and help me out please? Hello and thank you for the how-to. It saved us a lot of time. 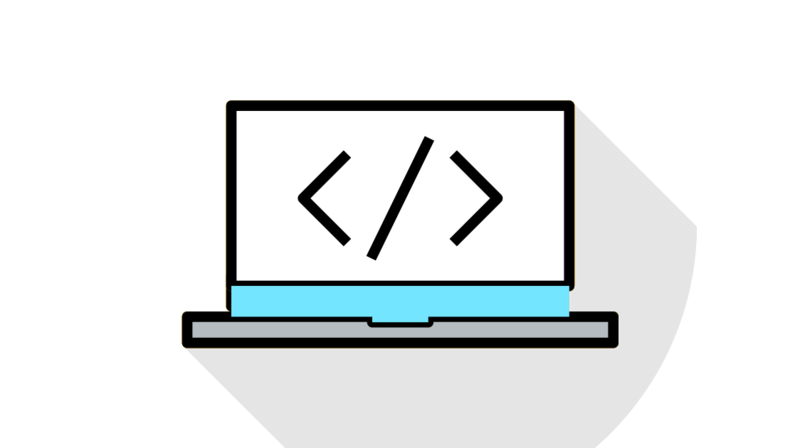 Do you know how to access the fields created this way through the REST API? (WC 2.6.x). hi Thanks For Post , it is really helpful & Awesome. here i am doing little extra , it will be really helpful if you can give me answer. i am adding new tab in product data ( For Example PRODUCT INFO ) , i want to add custom fields in to this tab . will i am new in woocommerce coding area , but i really need to know how to add custom fields to custom tab. how do i add product field value into admin order meta. any idea or suggestions please. Just what I was searching for! Thank you so much. Now I have question. How should I add an extra custom image upload field and than link this anywhere in theme? thanks for you code. Worked great for me. I noticed that some people are asking how to hook the custom fields into the cart page and email templates. However I cannot see a reply on one of the questions. Was this ever resolved? Just wonder how i can add a checkbox fieldtype with 4 tick boxes with different values? No idea what i am doing wrong but i could never make the // Product Select work. I would like to export a CSV file with my product add-ons in separate columns. They currently all go into line_items or item_meta. It is not a matter of screenshot, I’ve looked into it (as far as I can). Do you have a suggestion on how to include a “woocommerce product select” controller in a plugin/widget? I’m using your code and works great. I do have one question: is there any way to show the custom fields in add/edit product and on the single product page (frontend), only for specific product type? how can i edit fields value. ? i got it thank you so much …. Hello Remi, and thank you for this tutorial! This is great! I would have one quick question. I would like to know if I can use a hidden field to generate a value which is the result of the calculation between one number field (generated like in your tutorial) and the price of the product. My concrete example is the need to display the price per liter/kilogram/meter. I have the price per item, but the item weights a fraction of the measurement unit. Let’s say the item costs 10$ and weights 0,5 kg. I would like to be able to generate the price per kg for this item, in my case 10$/0,5kg=20$/kg. Hello, I want to add a Checkbox Field Type with many options so that the visitor can select them before finishing his / her order. How do you make the value of the amount of this option appear and add up to the amount of the invoice? Do you have any idea how to make the custom product select field work with WC 3.0.8? Hello Remi, can you approve my comment? maybe someone else can contribute… Thanks! Hello Remi, this is a great tutorial, can i ask a question regarding about this method? Thanks so much for this tutorial it is a great help. I have used it to be able to insert the fields just perfectly and that all seems to work fine. I am trying to use the field to populate the URL for a button I am placing on the woocommerce single product page. I cannot seem to get the code right to pull in the meta data from the new custom field into the url. Can you give me any guidance on what to put in the <a href ="CONTENT OF PRODUCT SAMPLE FIELD" area? Thank you for this post it is honestly the best-written one I have found explaining WooCommerce product custom fields! For some reason, though the ‘Products Select Field Type’ is only like 10px wide and can’t be used, do you know if this is a bug from a newer version of Woo? I have a problem I need help with: I need to able to display a dropdown selection of user meta data on the product/Add to cart page. For example, if a customer has user meta data: account_1, acccount_2 and account_3 in their user profile, I need them to be able to select one of their accounts on the product page. This value also needs to be attached to the order. Any ideas of how I could do this? how can i display multiselect field values in front-end single product page?